Joe Forte used a QR code and a smartphone app to learn more about fish and other items sold at Red’s Best at a recent farmers market in Boston. At the Dewey Square farmers market in Boston, leafy greens spill out of boxes next to stacks of ruby red cherries. Bundles of deep orange carrots spread across tables. Customers inspect produce, load vegetables into shopping baskets — and whip out smartphones to track the origin of the food they are about to buy. Technology has come to farmers markets, and it is transforming a cash-only business model that has remained relatively unchanged for centuries. Across the state, these modern-day bazaars are adopting wireless technologies, smartphone apps, and other advances to process electronic payments, promote their wares, and establish virtual markets where customers can buy from dozens of Massachusetts farms over the Internet. As a result, farmers and other vendors are increasing sales as technology allows customers across the income scale to buy more local foods. In particular, the ability to accept credit, debit, and other electronic payments has opened the markets to low-income families who receive food stamps, known today as the Supplemental Nutrition Assistance Program, or SNAP. Since the early 1990s, when the state stopped issuing paper vouchers, food stamp recipients have used electronic benefit transfer cards, similar to prepaid credit cards. 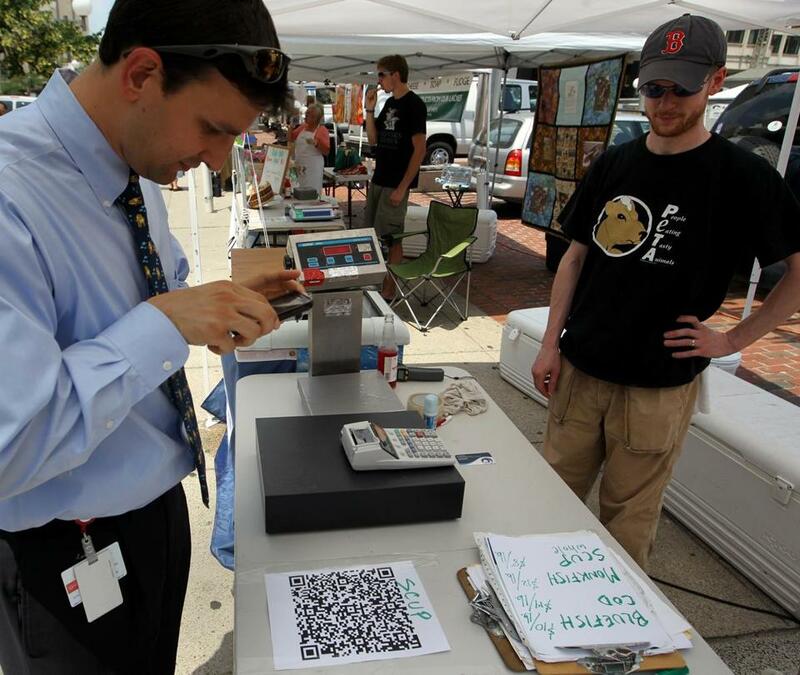 But without card-scanning equipment, most farmers markets were unable to accept them. Yet as new technologies emerge and costs decline, farmers markets are purchasing card readers and systems to process food stamp benefits. Today, more than a third of the state’s 247 seasonal farmers markets accept the benefits, and sales to food stamp recipients soared to more than $220,000 last year from less than $5,000 in 2007, according to state figures. Advocates, meanwhile, say lower-income families — many who live in so-called food deserts, or areas without supermarkets — have easier access to fruit, vegetables, and better nutrition. “It really improves accessibility for people at all income levels to fresh, local produce,” said Mimi Hall, operations manager for the Boston Public Market Association, which runs markets at Dewey Square and City Hall Plaza. These Boston markets have accepted electronic food stamp payments since 2010. Cards are swiped at a central location, where shoppers charge a certain amount and receive tokens or laminated “market bucks” they can spend with vendors. Sellers are later reimbursed from the market’s central account. It costs an average of $1,255 to buy equipment and run the system for a six-month season, although many markets have won state and federal grants to cover some costs, according to the US Department of Agriculture. In many locations, card readers that process food stamp benefits are also used to accept debit and credit cards, employing the same token system. This system can be awkward, admitted Jeff Cole, executive director of the Federation of Massachusetts Farmers Markets, a trade group in Waltham. But efforts are underway to simplify it. His group is developing software that would allow vendors to use smartphones, iPod Touches, or other wireless devices to conduct transactions. Customers would still swipe cards at a central location, but, instead of getting tokens, they would create an account. Vendors would then use wireless devices to charge those accounts. “It’s a banking system that’s within the market itself,” Cole said. Some vendors have turned to smartphone accessories such as the Square, developed by San Francisco tech company Square Inc., and the GoPayment system, by Intuit of Mountain View, Calif. In both cases, a small device plugs into a smartphone or laptop to allow vendors to swipe cards. An associated app processes payments and keeps transaction records. Brian Petrie Jr. of Q’s Nuts, which sells roasted, sweetened nuts at 10 markets in the Boston area, estimates that each market day Square allows him to make 10 sales he would have lost if he accepted only cash. Vendors are not limiting their use of technology to payment processing. Red’s Best, a Boston seafood company, uses software and mobile apps so customers can learn the source of the fish they buy. The company, which sells at the Dewey Square and City Hall Plaza markets, initially developed the system to ensure an efficient distribution system, tracking the fish from boat to pier to market. Now it gives customers access to this information through QR codes – those scrambled-looking bar codes that can be scanned by smartphones – linked to each type of fish. Currently, the QR codes are displayed on signs at the market booth, but soon each individual package of fish will be labeled with its own code. Shoppers with smartphones need only capture the code with their devices’ cameras and they are linked to a page describing the origins of the fish. Scan the code for cod and learn that the day’s catch was made by Tim Barrett on the vessel Odessa, using a hand line and fishing out of Woods Hole. One shopper, Bronwyn Cooke of Somerville, said the system is appealing because it makes it easier for potential buyers to sort out questions about where food comes from. Technology is also allowing farmers markets to migrate from city and town squares to the Web. The Massachusetts Local Food Cooperative, which operates in central Massachusetts, has launched a website on which 40 participating farmers list available produce, plants, and meat. Members place orders online, and, the first Friday of every month, farmers deliver to a central location, where the coop’s volunteers sort products into orders and deliver them to seven pickup sites. Sarah Shemkus can be reached at seshemkus@yahoo.com.